Her fondness for knits is well-known. She believes fashion is about severity and seduction. Designer Rina Dhaka has, over 15 years in the fashion industry, carved a name for her theme collections and her flawless silhouettes. 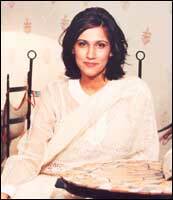 Here's what you should know about Rina Dhaka at India Fashion Week 2003. What is she wearing: Cool white short kurta, white pants and hair tied carelessly in a small ponytail. Where: Mumbai's Taj Mahal Hotel. The Delhi designer arrived in Mumbai Wednesday morning for a fitting schedule with the models participating in the fashion week. The cool cab driver at the airport gypped her -- she paid Rs 800 (almost double the actual fare). What can we expect from her collection: Holiday 2003. Spring Season 2004. Designs that are contemporary and make an impact. Sandy colours. Will display around 55 designs. The 'in' colours this season: Golds, beige, brown, grey-black, bits of white. How long did it take her to do this collection (IFW): Two months. Her favourite designers: She fits best into her own clothes. Loves knits, denim. Is a shoe freak. Likes designs by Donna Karan, Gucci, Mango, Diesel. What she plans to wear on the day of her collection: Doesn't know yet. Says she doesn't think of herself on the day of her showing. She will wear something functional, something in which she can bend and stitch. Perhaps a pair of jeans.